Printed booklets have been around for decades. While there are many ways to provide information in a concise and portable medium, printed booklets still serve many business and personal needs. The layout of the booklet is critical and is involved but not complex. Booklet pages are typically double-page design with printing on both sides. Basic, inexpensive booklets are printed, center-stapled and folded. Careful layout of the booklet will satisfy all its design requirements and ensure that the booklet achieves its intended purpose. Determine the overall usage, content and longevity goals for the booklet. Determine the audience and frequency of use. Identify the volume of content, ease of use and print characteristics -- type font, point size and coloration. Layout the booklet page with proportional margins for the assumed page size. If you are producing a booklet intended for temporary use and storage in a purse or pocket, you will need to size it for that purpose. However, if the content of the booklet results in an overly thick stapled booklet, go back and rethink the page size and font assumptions and then produce a new page layout. Create a mock-up of the target page by typing on an appropriately sized page with correct margins. This critical step allows you to actually see the planned page and how the font and line spacing will appear. Review the mock-up against your planned layout and recalculate if necessary. Calculate the approximate size and number of pages based on estimated word-count, font and point size. Example: Your estimated number of words is 2,000 and you plan to use a 10-point font. A booklet page-set -- assuming a 3 1/2-inch-by-5-inch page size and 1/2-inch margins -- would be 10 200-word pages each with 20 lines of text. If the above example, given a larger word-count, resulted in a 40-page page-set, it would probably not be workable because it could not easily be folded. Determine the booklet's page architecture by dividing the number of pages by four. This produces the sheet count -- the number of double-page, 2-sided sheets. In our 10-page example, there would be three sheets -- Two 4-page sheets (total 8 pages) and one 2-page sheet with two page frames empty. Visualize the front side of sheet 1. It would be blank on the left side and have Page 1 on the right side. Its reverse side would have Page 2 on the left and be blank on the right. Determine the cover requirements for the booklet including the cover lettering and artwork. Decide how the covers will be printed and bound. Use 100-lb card stock as your folding example. While this thickness of card can be folded, excessive inside pages will yield a booklet that will not lie flat. Finalize the booklet production strategy by deciding how it will be typed and printed. Most modern word processors have a multi-page layout capability, allowing you to type two pages side-by-side. However, you must maintain the page architecture manually when typing the pages. If you have access to a printer that can do both-side printing, your layout process is complete. If you are using a graphic design program, you will simply be typing pages and, upon completion, selecting the book layout option. The finalized graphic design file -- typically a .pdf file -- can be printed in any print shop that has double-side printing capability. Lastly, plan how the booklet assembly process will take place. This includes how the printed cover and inside pages will be cut, stapled and folded. Full-size books typically have 1-inch margins; small booklets typically have 1/2-inch margins. An easy way to visualize the page architecture is to fold three pieces of blank paper lengthwise and turn the pages, placing a page number at the top of the page. When complete, you will see the page architecture. Invest in a little extra paper and try multiple booklet mock-ups. Use caution when using automatic paper cutters and staplers. 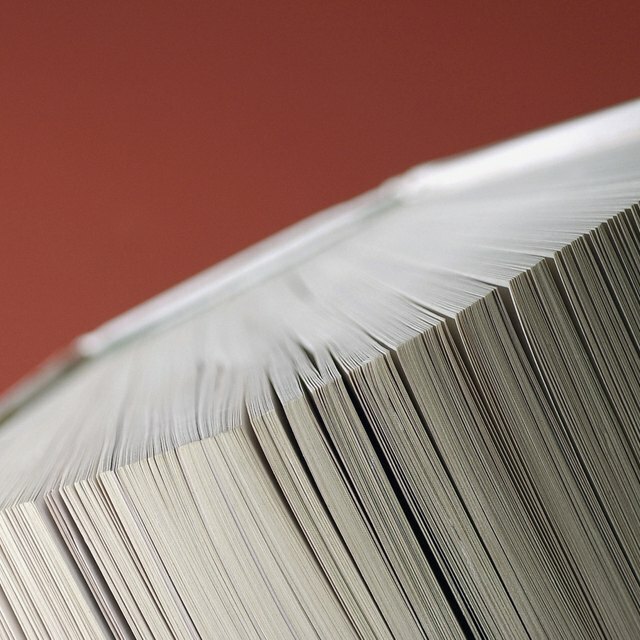 Full-size books typically have 1-inch margins; small booklets typically have 1/2-inch margins. An easy way to visualize the page architecture is to fold three pieces of blank paper lengthwise and turn the pages, placing a page number at the top of the page. When complete, you will see the page architecture. Invest in a little extra paper and try multiple booklet mock-ups. Microsoft: "Print a Folded Booklet"
James Roberts began writing professionally in 1989, focusing initially on methodologies, multimedia courses and how-to articles on information technology, business, software, health care and relationships. His published works appear on various online article databases and he holds a Bachelor of Science in business from West Virginia University.